Most of us become aware of our electricity costs during the summer when the weather is hot and our air conditioners are on full blast. In fact, the bulk of most American homes electricity costs come from central air conditioning and electrical heating pumps. The average cost to use central air or an electrical heating pump is nearly 4-times as high as the second least efficient product, which is your clothes dryer. Obviously, the cost of electricity plays a large role in calculating your electric bills, and the states with the most expensive electricity costs use natural gas or nuclear to generate their electricity. The highest average electricity bill by State is nearly double the least expensive, and it’s all because of the source used to generate electricity. In the United States, there are a several ways to produce energy. While renewables such as wind and solar have been gaining traction, they still require government subsidies to be competitive with other energy generation sources. If you built a power plant today, wind and solar power plants would actually be less expensive as it is very costly to build a coal operated power plant. The least expensive electricity generating source using existing power plants is coal, and the most expensive is petroleum liquids such as diesel. President Trump is attempting to renew interest in the coal industry, making it a higher profile energy source. The President faces an uphill battle, given the recent declines in the costs of other energy sources. 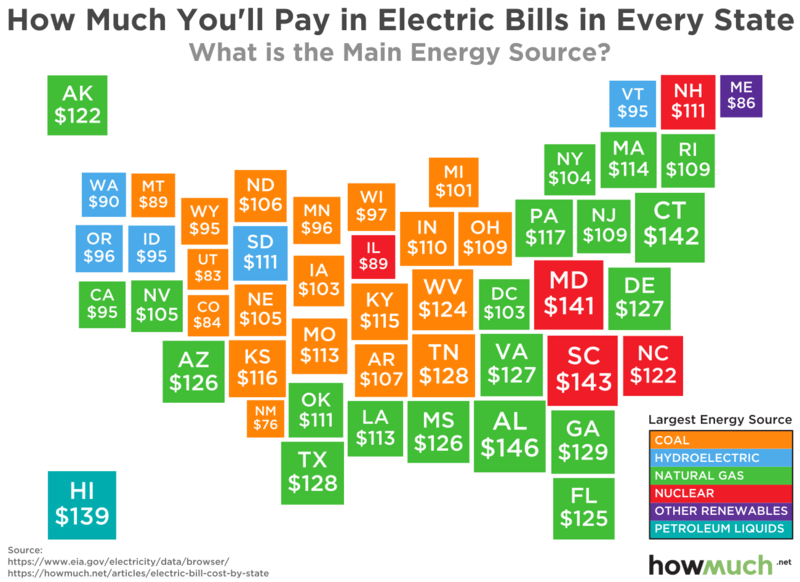 Here are the states with the most and least expensive electricity bills in the United States. While central air conditioners and home heating units can play a role in determining a state’s average electricity cost, the factor that drives the price the most is the source for generating power. States that use coal as their source to generate power have the least expensive average monthly electricity bills, while states that use peak natural gas and nuclear energy to generate power have the highest average monthly bills.